The 2011 RC Laser North American Championship is in the books and class manufacturer, Jon Elmaleh, once again, showed us how it’s done with his 8th North American victory since 2000. The Rock Hall Yacht Club in Rock Hall, Maryland played co-host with the Cooper River RC Laser fleet to provide two wonderful days of competitive racing. There was plenty of social time to get to know the new competitors and see old friends. 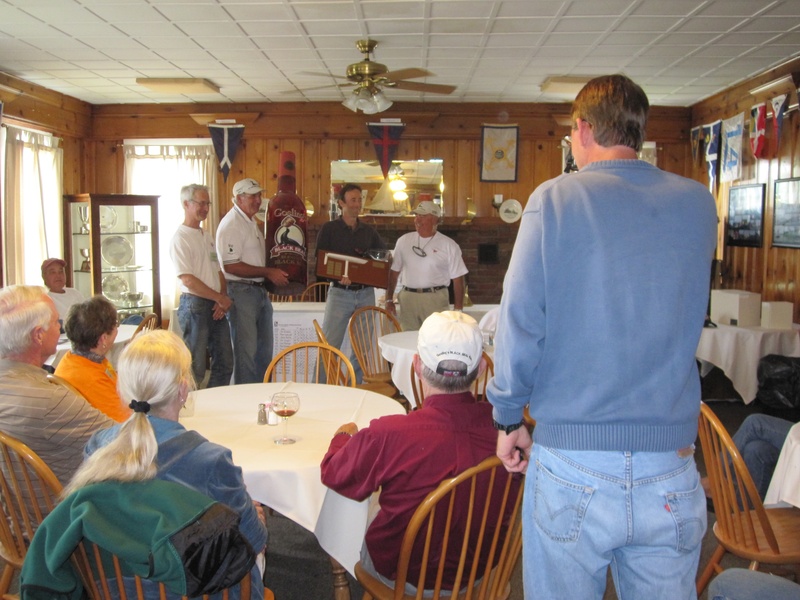 Regatta chairman, Nick Mortgu, was able to garner a host of wonderful sponsors who not only provided products for door prizes but also added to the social excitement of the regatta. The format for the regatta for the 29 competitors was a day of seeding races held Saturday to divide the racers into two fleets, Gold and Silver, each who would race to decide the two fleet champions on Sunday. Total points scored after one throw out race on Saturday were carried over and added to Sunday’s races where 6 races minus one additional throw out from Sunday were used to decide the championship for the top 15 in the Gold Fleet. Mortgu, provided the two fleets beautiful glass bowls as awards for each fleet. Two competitors who arrived feeling under the weather with strong colds were unable to compete the full chamionship. This weekend was the first in many months that we have seen sub 60 degrees in the early morning. Jon Elmaleh defeated the most competitive RC Laser fleet in recent history with good starts, a nose for clear air and a calm steady thumb on the tiller. Jon took a 2 point lead into Sunday and distanced himself from the fleet, throwing out only a 2nd on day two to win by 15 points over two time defending champion, Jim Kaighin, who came from 4th on Saturday to nail down 2nd overall. Ryan Lippincott moved to third in the final standings with Jamie Betz and Rob Seidelmann rounding out the top five. 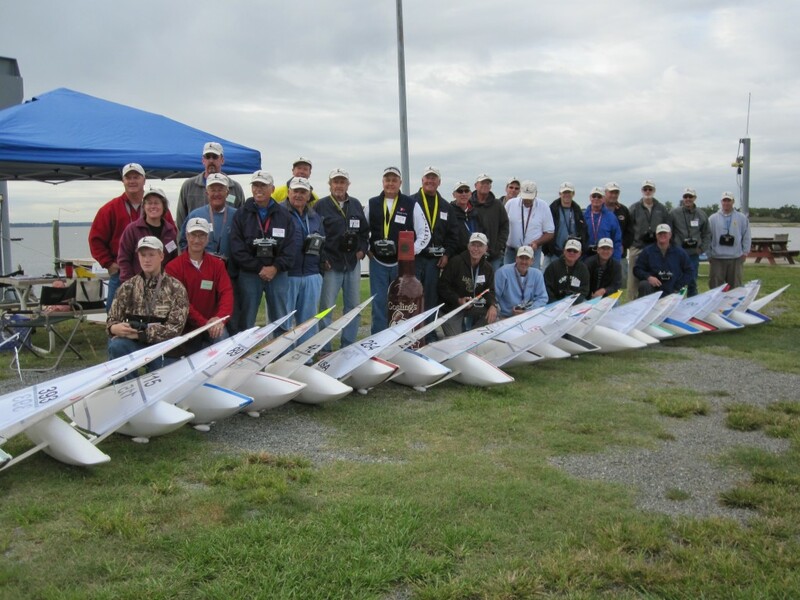 Cooper River’s RC fleet placed three in the top five. Conditions called for use of the A sail along but there were some good puffs to keep it interesting. Very few B sails were used with success. Shifting winds from the east and north helped shake up the positions in almost every race. Everyone in the fleet (other than Jon Elmaleh) seemed to have a least one or two good races but the best skippers kept the double digit finishes to a minimum. In the Silver Fleet, local skipper, Tom Lippincott, bested local newcomer, Chip Lieber, to win with Victor Oberg placing third. Tom and Chip represented the host Rock Hall YC which provided buffet breakfasts and lunches as well as a group dinner on Saturday night.